Served on Crystalline Silica Panel at Triangle ASAC meeting in Raleigh, North Carolina in January 2018. Taught “Discovery 101: Getting the Most out of Basic Discovery Tools,” a Continuing Legal Education program, at the 2016 NCBA Joint Construction and Litigation CLE in New Bern, North Carolina. Taught “Deadlines, Drafting, and New Developments in the Law,” a Certified Paralegal Education Course, at the North Carolina Paralegal Association’s 2016 meeting in Wilmington, North Carolina. Presented on immigration and E-Verify compliance at the Waterproofing Contractors Association Spring 2016 Conference in Mount Pleasant, South Carolina. Spoke on changes to North Carolina Lien Law Statute at North Carolina Masonry Contractors Association annual convention, April 2013. Spoke on changes in North Carolina construction law and on the Davis-Bacon Act at North Carolina Masonry Contractors Association annual convention, April 2012. Spoke to Raleigh Chapter of North Carolina Masonry Contractors Association on North Carolina lien and surety bond law, March 2011. Presented South Carolina legal update to Waterproofing Contractors Association at annual meeting, March 2010. Spoke to the North Carolina Bar Association and United Minority Contractors of North Carolina joint committee about the federal Deferred Action for Childhood Arrivals policy and its impact on immigrants and local businesses. Caroline Trautman is licensed to practice in North Carolina and South Carolina. She focuses on construction law, business law, and collections and pursues and defends claims for businesses, insurance carriers, and individuals. Caroline counsels general contractors, subcontractors, owners, and other construction professionals in many aspects of their business including formation, contract negotiation, resolving disputes, collections, and litigation. 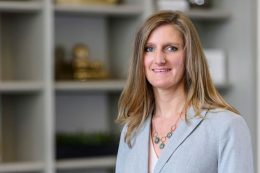 Her construction practice encompasses contract drafting and review, contractual disputes, compliance, employment law, liens and bonds, defect claims, and litigation. Additionally, she represents businesses and insurance companies in subrogation and arbitration of homeowner and automobile claims.